Emoluments Hearing Hints At What May Be At Stake: Trump's Tax Returns If a federal judge lets the plaintiffs proceed with their lawsuit against the president, the next step would give them access to some of his financial documents — perhaps including tax returns. A lawsuit against President Trump alleges he is violating the Foreign and Domestic Emoluments clauses of the Constitution. Plaintiffs' lawyer Deepak Gupta says Trump's Washington hotel (above) is "an emoluments magnet." If there's one thing President Trump's critics want from him, and he refuses to give up, it's his tax returns. The returns didn't come up during Wednesday's hearing in U.S. District Court for the Southern District of New York in Manhattan. But the hearing was the first step in a process that could loosen Trump's grip on them. If the next step goes the plaintiffs' way, the case could make the president's tax returns surface. 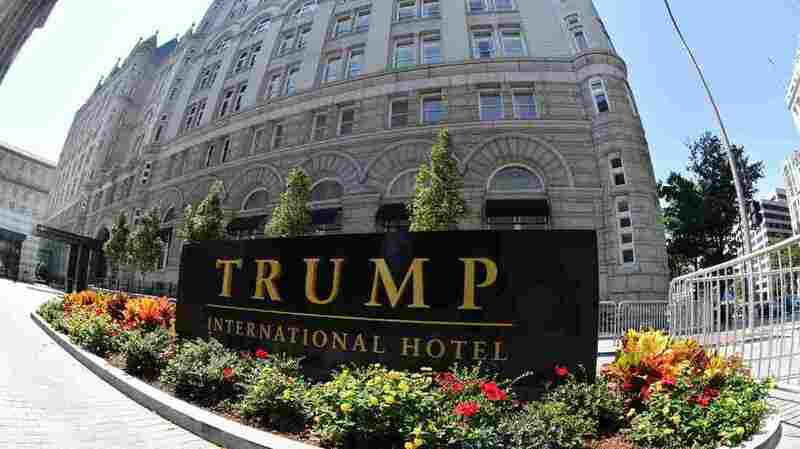 Trump is being sued by four plaintiffs who allege he is violating anti-corruption provisions in the Constitution, namely, its Foreign and Domestic Emoluments clauses. If Judge George Daniels says the plaintiffs have legal standing to proceed with the suit, they then can seek internal financial documents, including those tax returns. "We will be looking for detailed financial records, foreign and domestic transactions, in the president's businesses," plaintiffs' lawyer Joseph Sellers told reporters after the hearing. "If the tax returns turn out to be relevant we may seek them." Trump is the only president since 1977 to withhold his tax returns from voluntary disclosure. Unlike recent presidents, he has also refused to comply voluntarily with the federal conflict-of-interest law. Doing so would have forced him to separate himself from the Trump business empire. The lawsuit comes from three plaintiffs in the hotel and restaurant industry, and one watchdog group, called Citizens for Responsibility and Ethics in Washington. The Constitution's clauses banning emoluments — that is, money and other favors — are meant to keep federal officials out of conflicts of interest. Plaintiffs' lawyer Deepak Gupta told Daniels that Trump's Washington hotel is "an emoluments magnet." Its international business has been burgeoning, according to news reports. Justice Department lawyer Brett Shumate said the plaintiffs failed to show they have been injured by Trump hotels and restaurants, so they wouldn't have legal standing. As the hearing wrapped up, Shumate opened a possible argument that presidents aren't even covered by the Foreign Emoluments Clause.